Raith Rovers boss Ray McKinnon is facing a defensive dilemma for Saturday’s visit of Livingston with three key defenders all missing through suspension. David Bates and Lewis Toshney will miss the match due to an accumulation of bookings, while Kyle Benedictus also sits out after picking up a three-game ban for his red card against Falkirk. McKinnon can take comfort from the fact that Iain Davidson, who missed last week due to injury, and Jason Thomson, who suffered a broken nose at Falkirk, are expected to be available. However, to complete his back four the Raith boss faces the prospect of taking a gamble on the fitness of Craig Barr, who only played his first 90 minutes of the season in a 4-0 development league win over Alloa on Monday night, or moving a midfielder into the back four. Speaking to the Press on Tuesday, McKinnon said: “We’ve got a lot of dilemmas and a lot of things to think about in terms of that position. “We’ll cerrtainly have a team but I’m not exactly sure who’s going to be playing where! “Jason will play - and it was great to have him back on Saturday. He and Aidan Connolly worked brilliantly together in the second half and I’m really excited about those two playing together. “Craig Barr played his first 90 minutes for nearly a year on Monday so we need to see how his body reacts this week. It’s a big ask for him to step straight back in. Livingston are fighting for their lives and they’re a handful up top . “It may be needs must, and we’ll just have to throw him in, but we’ll see how he is come Thursday. “We’ve got options, but it’s another headache for me. “It’s been a season of constatnt distruptuions, but we’ve dealt with it and we’re still right in the mix for that play-off spot. “All we can do is try to have the best end to the season possible, and everybody give everything they can, and see where it takes us. “I know they’ll do that because they are resilient in every game. We just need that wee bit of luck to shine on us, and maybe that was it on Saturday with our first goal. 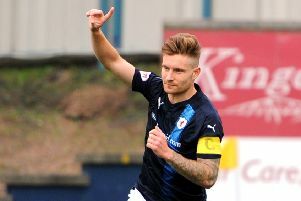 Raith dropped to fifth in the Championship following Saturday’s draw and are now two points behind Queen of the South in the race for fourth place. However, despite a run of just one win in 12 games, including five draws, McKinnon insists the team is not under any pressure to get back to winning ways. “If we were sitting second bottom we’d be thinking we need a win, so there’s no pressure,” he said. “The boys are playing well and nobody can question us in terms of performance levels. “We’ve had tough games against good teams and given everything. Louis Longridge is also a doubt for Saturday after missing training this week. “He tweaked his knee jumping over a wall, which just sums up our luck,” McKinnon added. New loan signing Ryan Hardie from Rangers is expected to be included in the squad.